Personalised Christmas tea towel featuring Baa Humbug Sheep motif and embroidered with a personalised name to make a truly special gift. 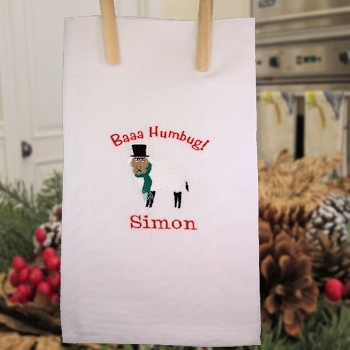 Personalised Christmas tea towel featuring Baa Humbug Sheep motif and embroidered with a personalised name to make a truly special gift. Unique and useful gift idea for men or women. Choose the Text. Personalised Christmas tea towel featuring Baa Humbug Sheep motif and embroidered with a personalised name to make a truly special gift. Unique and useful gift idea for men or women. Choose the Text. Choose the thread colour and font style. This humorous embroidered gift features the classic Christmas Carol Scrooge in the form of a Sheep with a wooly scarf and the words above Baaa Humbug! We use natural cotton tea towels hemmed on all the sides. 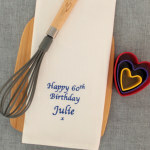 A good size tea towel at approx 52 x 72cm You can have any name or nickname you want! Choose a thread colour and letter font style for the text. At Amys Gifts we do all our own embroidery work especially made to order and do our best to get most orders dispatched within approx 48 hours, Any queries please email us.